Prairie Sky Poplar is a fast-growing columnar hybrid poplar developed at Agriculture and Agri-food Canada's Morden Research Station. It is adaptable to many soil conditions and seems to do best in the southern-most parts of the prairies. 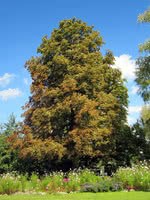 Good as a shade or shelterbelt tree, it is often used in buffer zones as a visual screen or hedge. Ideal for lining properties, roads, etc.